Douglas Connection did some re-termination of PNF Audio speaker cables for me recently. I really like these Furutech FP-202G angled locking banana plugs. My Dahlquists have binding posts that angle up and normal banana plugs would eventually bend under the pressure. The Furutechs allow the wire to come out at a downward angle plus they accept another banana to be inserted in the locking end. The photo below depicts my LSi-M 703's, which have straight-out binding posts but I like the Furutechs on them as well. 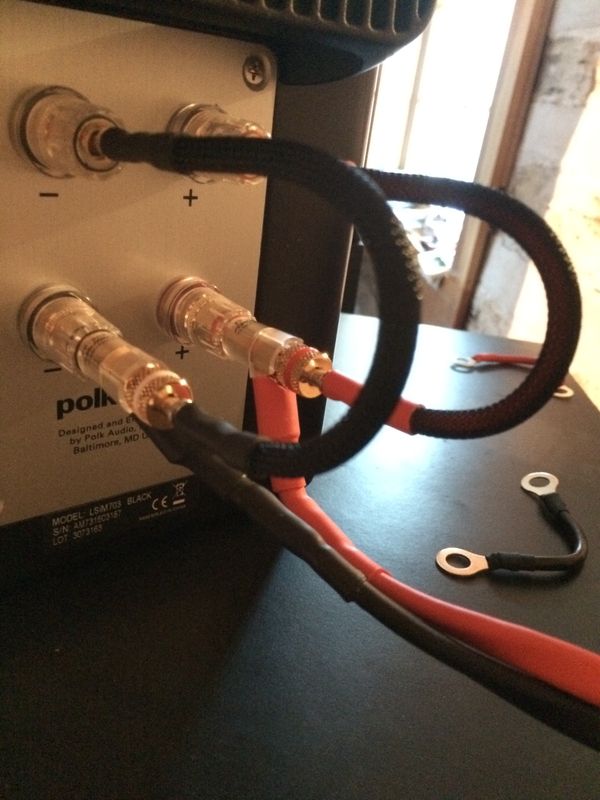 I had Doug make me some jumpers out of 6 inches off the end of the PNF's, which are much better than stock jumpers, and allow my to easily switch out different speakers when I want and these locking plugs stay out when in place. The Furutech plugs are real quality and anyone considering replacing those cheap compression banana ends that come on a lot of cables should contact Douglas and look into re-terminations. I typed the above on my i-Phone, and I noticed a typo, it should say "these locking plugs stay PUT when in place." I've had problems with some bananas that slip out and just don't stay put. Even some locking bananas of lesser quality. Those look great! How's the sound? The Furutechs sounded real good right out of the box and even better after a bit of break-in. Quite an improvement over the stock bananas. Furutech makes quality plugs with quality materials.